Authentic refinement and appeal: a new masterpiece by Custom Line took to the water with its seductive harmony of styles, shapes and inspirations. The Ferretti Group Superyacht Yard in Ancona recently hosted the launch of a fifth Navetta 33, the extraordinary work of nautical engineering that has won so much praise from both experts and the general public. The fifth Navetta 33 was custom-built for a North American yachtsman, who will “take it for a spin” on a Mediterranean cruise with his family before returning across the Atlantic. America remains of crucial importance for Custom Line. Impossibly chic, Navetta 33 turns heads thanks to its exquisite lines and a painstaking attention to detail. The superyacht epitomizes those values of seaworthiness, comfort, safety and customization that have always been at the core of Custom Line’s DNA. The fifth Navetta 33 is yet another fruit of joint efforts by the Product Strategy Committee – headed by Mr. Piero Ferrari -, Studio Zuccon International Project, which was responsible for the exterior design, and the Group’s Engineering Department, whose architects and designers crafted the striking interiors. Among the noteworthy features, a hull with bulbous forward section, designed from scratch, provides seaworthiness and stability performance at the very top of its class. In addition, yacht owners and their guests can enjoy marvellous spaces across all four decks: from the wide-body master suite forward on the main deck, to the four guest cabins on the lower deck. 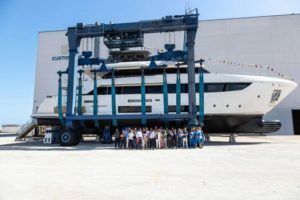 The launch of the fifth unit of Navetta 33 comes at an exciting time for Custom Line and the Ancona Superyacht Yard, which in the space of a single month has seen the launches of the fifth Navetta 33, the fifth Navetta 37 and the first ever Navetta 42, the brand’s first mega yacht above 300 GT. The event was held at the Ferretti Group Superyacht Yard in Ancona, a world-class ship-building facility that produces all the steel and aluminium mega-yachts for the CRN, Riva and Pershing brands, as well as the entire Custom Line fleet in composite. Among the vessels created here are Navetta 28, Navetta 37 and the new flagship, Navetta 42, which is set to debut at the 2018 Cannes Yachting Festival as the largest Custom Line model ever built.